Whether we want to understand where a shared supply of teaspoons has disappeared to, or why countries take themselves to the brink of nuclear war, Game Theory reveals the decision-making process. 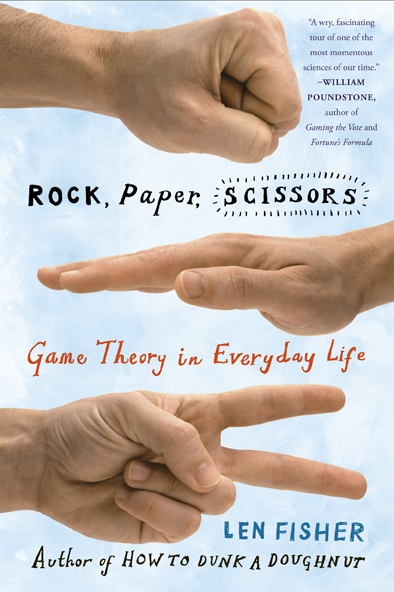 In Rock, Paper, Scissors, Len Fisher explains Game Theory, the study of co-operation and the underlying strategies that shape human behaviour. Len Fisher’s writing brings this science of interaction to life with anecdotes and applications that are sure to spark the imagination and give you pause for thought. Dealing with collaboration, co-operation, competition and confrontation, Rock, Paper, Scissors is essential reading for anyone interested in what it takes to get people to work together. Australian Graduate School of Management. Winner of computer tournament on strategies for effective cooperation.